the conversation is respectful and caring and leads to greater understanding. 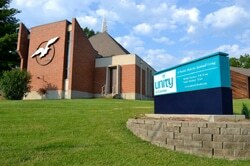 Small Group Ministry is a vital part of Unity of Columbia. Groups of 8-10 people meet weekly to reflect on and discuss significant life topics. Each series lasts 10 weeks and includes an introductory “kickoff” session, 6 weeks of video-based curriculum and discussion, a social activity and a service project. At the end of the series, all the SpiritGroups join together at Unity for a celebration and to share what they have done. Each group is facilitated by a member of our congregation who has been trained to be a SpiritGroup Leader. The time together is structured: Groups begin with prayer, followed by a check-in question. Then there is a short (12-15 minute) video followed by discussion. The group ends with a closing prayer. SpiritGroups have “open enrollment” during the first two weeks of each series and request a commitment of 10 weeks.